How to enjoy Blu-ray and DVD movies on Samsung Epic 4G? Home » How to enjoy Blu-ray and DVD movies on Samsung Epic 4G? The Samsung Epic 4G comes with a 4.0-inch Super AMOLED display, which absolutely mesmerized us. With the ability of displaying 16 million colors and the WVGA resolution feature, the Samsung Epic 4G delivers you vibrant images and fantastic looking videos and movies. But what’s the best way to enjoy Blu-ray and DVD movies on Samsung Epic 4G? Thankfully, this guide is just about to provide the new Epic 4G owners with a special solution on how to enjoy Blu-ray and DVD movies on Samsung Epic 4G, just feel free to check it and get what you are looking for. Click “BD/DVD ROM”, or “BD/DVD Folder” to load your Blu-ray/DVD movie files. Or you can click “IFO/ISO” to load your DVD files. Notice that a BD ISO image is not supported by directly importing, to add BD ISO image file to the program, you need a virtual BD drive. To enjoy Blu-ray and DVD movies on Samsung Epic 4G, you need rip Blu-ray and DVD to Epic 4G compatible file formats by using Pavtube Blu-ray DVD to Epic 4G converter. 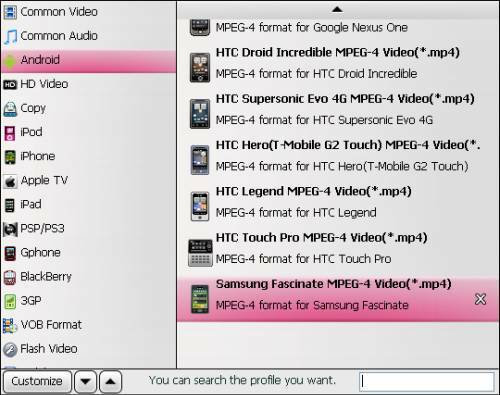 Just click on the drop-down list of “Format”, and then follow “Android”> “Samsung Fascinate MPEG-4 Video (*.mp4)”. Since both Samsung Fascinate and Samsung Epic 4G are belonging to Samsung Galaxy S model, so the MP4 format designed for Samsung Fascinate is also available for Samsung Epic 4G. 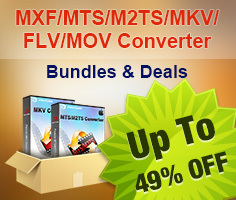 When using Pavtube Blu-ray DVD to Epic 4G converter to rip Blu-ray and DVD to Epic 4G supported file format, you are allowed to adjust audio and video parameters to custom the output file quality. Click “Settings” button, then you are able to adjust all the options shown in the following window, including codec, aspect ratio, bit rate, frame rate, sample rate and audio channel. Once the above mentioned 3 steps are finished, you can click the big button “Convert” to rip Blu-ray and DVD to Epic 4G supported file format. When the ripping task is done by Pavtube Blu-ray DVD to Epic 4G converter, you can click “Open” button to get the final output files. Now just enjoy Blu-ray and DVD movies on Samsung Epic 4G for more fun.